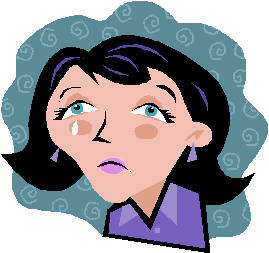 Dealing With a Lupus Depression: How Do You Cope? How do you combat a lupus depression? The B.G.T.Y. Theory. Because lupus can force you to make adjustments in your life and any change is not always easy, it is understandable how you could feel down sometimes, how could you not? The holiday season can amplify any feelings of isolation and loneliness. In general, people with chronic illnesses like lupus, are at higher risk for depression. Studies have shown that as many as 60%*of people with chronic illness can face depression at some point in their lives. It is very important to recognize these feelings and if you have sadness or depression that lasts more than a few weeks, we, at Kaleidoscope Fighting Lupus encourage you to have those feelings evaluated by a medical professional. When anyone suffers any kind of a loss, they will inevitably go through the five stages of grieving. Finding out that you have an incurable illness like lupus, is certainly a loss. Perhaps you feel that you have lost the vision of the kind of life you expected to have- hoped you would have. These feelings of loss are valid and must be dealt with before you can move through to stage 5, acceptance. Everyone moves through these steps at different paces, and for no two people is it the same. Some find that the depression stage takes the longest to move out of, for others it is anger, and still for others it can be denial and so on. If you are feeling any or all of these following signs, please talk to somebody you love and trust and/or seek medical assistance. You don’t ever have to ‘go it alone’, there are people out there who care! Feeling empty, hopeless, or helpless and like you can’t work your way through these emotions on your own. Feeling like you can’t go on anymore. Feeling like a failure and that nobody cares about you. The task of finding resources can be daunting but there are places on the web you can go to find the help you need. If you would like help in finding the right caregiver for you here are some useful links. What is the B.G.T.Y. Theory? It is quite simple actually. Be Good To Yourself. Surround yourself with supportive people- If you have great family and friends around you, this can be an important network to anyone with a chronic illness. 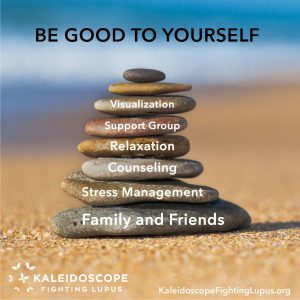 If your family or friends are far away or they ‘just don’t understand,” then try to find online or local support groups for other lupus or chronic illness sufferers, like the ones here at Kaleidoscope Fight Lupus! Just take one day at a time- Why worry about tomorrow when all you can control is what you accomplish today? It may help calm the overwhelming feeling of worry about all you need to do and just help you get through this day. Try to stay active-Even though you have days that you will not feel up to moving around, try to stay active in general. Be engaged in hobbies, clubs, groups, yoga or tai chi or any other mind-body exercises. This kind of engagement can really lift your spirits and make you feel empowered over your illness. Keep a ‘go to’ list of things that make you feel better, like a funny movie, music you enjoy, a special walk that makes you happy, hanging out with friends. Keep that list handy for those tougher days. The mind/body connection is a very important factor in your well-being. Stay informed about lupus- The more you know about your medical options, the more questions you ask of your physician and other medical providers, the more empowered you will feel! Watch that negative self- talk. Replace it with positive self-talk. We are all guilty at times of being our own worst enemy. Unfortunately, over time, that negative talk can wreak havoc on our self-esteem. Be kind to yourself, having faith in the knowledge that you are doing the best that you can on any given day. Lupus is unpredictable and if laying low for a while ( a day, a week, a month or several) is what your body demands, then that is honoring your body and your well-being, so be kind to yourself! *All images unless otherwise noted are property of and were created by Kaleidoscope Fighting Lupus. To use one of these images, please contact us at info@kflupus.org for written permission; image credit and link-back must be given to Kaleidoscope Fighting Lupus. **All resources provided by us are for informational purposes only and should be used as a guide or for supplemental information, not to replace the advice of a medical professional. The personal views do not necessarily encompass the views of the organization, but the information has been vetted as a relevant resource. We encourage you to be your strongest advocate and always contact your medical provider with any specific questions or concerns.